aside	Artist and writer Chris Dean speaks to ASLI about her mental illness, creativity and recovery and says “Art can give a voice to the things we can’t find the words to say. Those feelings that are so big, they feel like they might tear us to pieces from the inside out”. Chris Dean, aged 44, lives in the state of Indiana, USA, with her husband and four adult-kids, in a self described “petting zoo” of cats, ducks, geese and chickens that she and her family have made into their home. A self taught artist who relies on her gut instinct when creating. Chris writes a humor blog and is a contributing author to two anthologies (Clash of the Couples and It’s Really 10 Months: Special Delivery), and she has had work featured on In The Powder Room, Huffington Post, Scary Mommy, Midlife Boulevard, and Bonbon Break. With this extensive portfolio of writing and contributing, ASLI felt that Chris not only created emotive and inspiring visual art but is a creative who has something to say and is actively seeking platforms to express herself. We admire Chris for her openness on her recovery from dark thoughts and emotions. At the time I made Emerging From Darkness, I’d spent the last couple of months in a really dark place. Emotionally, I’d bottomed out and had been using art as a way to explain to my family where I was. When I started to come out of the dark, I felt like I needed to share with them how it felt to reemerge and all the hope and renewal it brought with it. I think most artists speak in their own language of symbolism. I’m no different. I grasp for whatever images, metaphors and medium can best describe what I’m feeling at the time and then combine them to tell my story. This is gonna sound weird, but I’ve been the most inspired by art my brother and kids made in grade school. I mean, if you give a small child a pile of supplies, they don’t worry about how you’re supposed to use them or what’s supposed to go together, they just make things. It’s purely from their gut and their imaginations. That kind of freedom and art-without-borders is what I love most about creating. My husband is my biggest inspiration. The guy has put up with so many of my quirks over the years and always been nothing but supportive. Regardless of what’s going on, he’s always there, trying to understand whatever I’m dealing with. And when he can’t understand, he’s there with a hug. He loves me just as I am, cracks and all. I’m passionate about patient’s rights, advocating for yourself, and ending the stigma surrounding mental illnesses. Art can give a voice to the things we can’t find the words to say. Those feelings that are so big, they feel like they might tear us to pieces from the inside out? Art can be that conduit …that release. It gives our thoughts, feelings, hopes and fears a place to go and a way others can understand us. There have been a few times I was so low, that I’ve thought about ending my life. I felt like I was isolated and lost without any way to get back to “me”. Instead of doing the unthinkable, I poured all of it out on paper and in clay. I let myself ask for the help and understanding through my work, that I couldn’t figure out how to ask for any other way. And then I shared it with my online community. The number of people who reached out, not just to support me, but each other was astounding! For me, just knowing I wasn’t alone gave me the strength I needed to start climbing back out of the darkness. 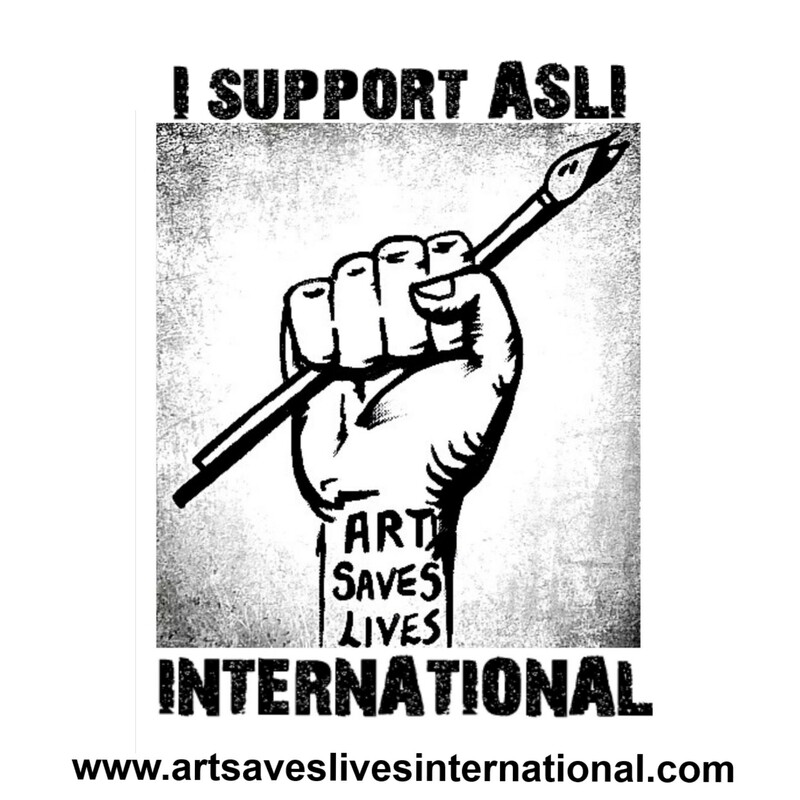 I truly DO believe art can not only save lives but create change by promoting understanding and providing a common ground. I want to learn to weld. I have boxes and piles of things I’ve found while walking in the woods or digging through bins at thrift stores. I would love to be able to put them together into a giant story you can touch. Mostly, I just want whatever I create to open the doors to a little more understanding and acceptance and a little less stigma. I carry a diagnosis of bipolar II, borderline personality disorder, panic disorder and moderate agoraphobia. I kept it to myself for the longest time because I was ashamed. But the more I heard people crack jokes or spreading inaccurate info about mental illness, the madder I got! Eventually, my big mouth got the better of me and I started talking openly about it, not for myself, but for those who can’t find their own voices. I always figure if I can help one person understand that it’s a diagnosis, not a decision – or dispel the stigma, it’s been a damn good day. My art gives me a place to put the emotions and thoughts that my head is too small to hold. It also gives me a universal language to express and explain some of the more chaotic emotions of BPD without the need to search for the right words. When you’re trying to explain a mental illness from the inside out, it seems like people respond better to the emotions of images than they do the explanations in words. Sadly, yes. Last year I had an interview about my piece in an upcoming book (Clash of the Couples). The reporter was very interested until she asked about my advocacy work. When I mentioned my diagnosis, she physically leaned away from me. (Not even joking!) Needless to say, the interview was over and the article was never written. That’s just the most recent fun. People fear things they don’t understand. Unless you either live with someone or you yourself live with it, most folks just want to pretend it’s not part of their world view. Personally, I hate feeling marginalized for something I have no control over. It’s a feeling I don’t want anyone to ever experience! So I talk about it and try to explain it through my work. I live in a small town in South Central Indiana. People are not very accepting of anything they see as different. Especially mental illness! If what I see on television is any example, the rest of society isn’t much better. Sadly, people really do fear what they don’t understand. It’s why I feel it’s so important to talk about it. Every little bit of myth-dispelling knowledge helps! Right now, I’m not sure how much they do. I mean, they have PSA’s and one month a year there are more pamphlets available, but I don’t see a lot of community outreach programs. The only time mental illness is really a topic seems to be when a tragedy occurs. There really needs to be more emphasis on erasing the stigma, making it as normal for parents to seek help for their kids’ mental health as they would for childhood cancer. I’ve never tried creative therapy. I wish I could’ve! The one thing I have done is take a portfolio to session and show it to my therapist as a way of helping her understand where I was at. I talk to a lot of people who feel like they have problems explaining their emotional states to their therapists. It’s terrifying to talk openly when you’re worried about something being misinterpreted. I tell them to write a poem, draw or paint a picture, free-write – anything that helps them express the things they can’t bring themselves to say. Not only is it an excellent way to communicate, but just the process of creating is therapeutic in and of itself. YES! It’s like when you hear a piece of music that moves you to tears or see a piece of choreography that fills you with joy. You’re not distracted by words, you’re connecting to the creator on a gut level. Some part of you just gets it without worrying about things like their social standing or whether or not they heard voices. If more people could connect on that level to the artist and what their work represents, I think it would erase a lot of the lines that divide us and create a space that fosters understanding. I love what you guys are doing! I’ve used my art to explain and express things to my small, online community. The thought of an International Group bringing together artists from so many different backgrounds and disciplines to do the same thing? Was one of the coolest things I’ve seen in a long time! Absolutely! Yes, there are laws in place that make it illegal to discriminate against someone due to a mental illness, but it’s still a major problem. It all goes back to the fact that people fear what they don’t understand and when all they see in the media is fear-based and worst-case-scenario, it’s never going to improve. I think labels are a two-sided coin. On one hand, they can serve a purpose. If I know what’s going on, I can begin working on how to live with it/around it. I can form a treatment plan. I have a starting point. On the other hand, there’s the danger of forgetting I’m a person, not a diagnosis. It’s also a label that will follow me my entire life. The real problem with labels is the way people look at them. Like you said, a diagnosis of Depression or BPD shouldn’t carry any more stigma than that of diabetes. For me, it makes me want to work with you more! To me, it means you understand the problems from the inside out. As someone living with a mental illness, it means I’m in a space where I can relax without worrying about what you’re thinking when you read my laundry list of a diagnosis. It also means you’re giving people a chance to work hard at a job they’re passionate about – a job where they don’t have to worry about the break room gossip if a coworker finds out they have a mental illness. I’m not sure how anyone could ever see that as anything but good. I’d say most of the people who come to mind use their work more as therapy than to raise any kind of awareness. It’s only in recent years that performers and celebrities have started speaking openly. Oddly enough, society doesn’t seem to mind mental health issues in its creative types as much as it does on a day-to-day basis. It seems like they almost expect it. Using that strange place of allowance to openly discuss can only be a good thing for all of us! I can’t thank you enough for the opportunity to share my work for something I believe in so passionately! Art doesn’t just beautify the world, it really is it’s own language. Thank you for letting me share that. Next John Ledger is a visual artist who uses his art to commentate on social/political issues. Speaking to ASLI about his own mental health and our worlds general malaise, John states “Our UK government is making life harder for the majority, under the word ‘austerity’. It is doing the opposite of helping people, because they are, making the problems that harms mental well-being worse”.